I expected Toledo to be full of holes. Or I expected it to be completely and utterly Toledo. I don’t know exactly where the phrase originates from but ‘Holy Toledo!’ is one of those American exclamations you don’t hear very often now, and is often confused with all the various ‘Holy’ exclamations used by Robin in the Batman TV series of the 1960s. Those I think were derived from ‘Holy Toledo’. Oh hold on, this just in, Toledo was a very holy city historically in Spain. There is a big cathedral there after all. There is a Toledo in Ohio, and if you say ‘Ohio Toledo’ quickly it sounds a bit like ‘Holy Toledo’ but no, no it doesn’t really. I think it has some relevance to baseball announcers, “Holy Toledo, what a hit!” or similar. So with all that on my mind, we got on a train from Madrid, and we went to Toledo. I think ‘Hilly Toledo’ is a more accurate phrase. That place was full of steep streets and winding narrow alleys. We arrived and jumped onto one of those open top tour buses outside the station, not a cheap ride, but it went all around the edge of the town for all the amazing views over this well-contained citadel perched on a hill in a bend of the Tagus river. It is a beautiful sight, a medieval city preserved in all its old Castilian glory. The droning voice on the headphones told us about the Moors, and the old Visigothic Kings, and how Toledo was the ‘City of the Three Cultures’ for its blend of Muslim, Jewish and Christian populations, and lots of other interesting facts presented in a dull, sleepy way. I mimicked it which was not too hard as I too am dull and sleepy. Well, in real life perhaps, but when I was an open-top-bus tour guide in London I was much more animated about presenting history. 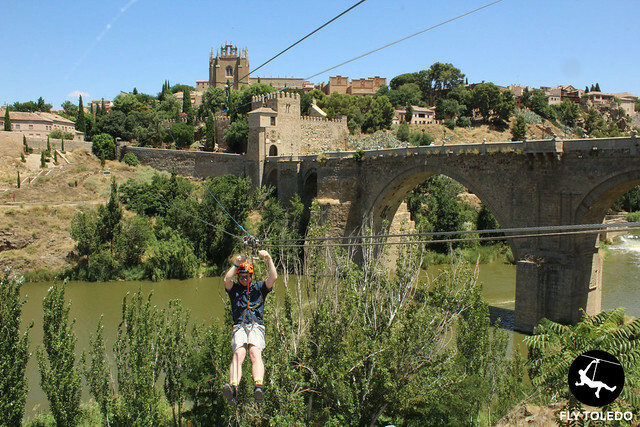 One of the spots I liked most was the Puente de San Martin, above, a 14th century stone bridge. 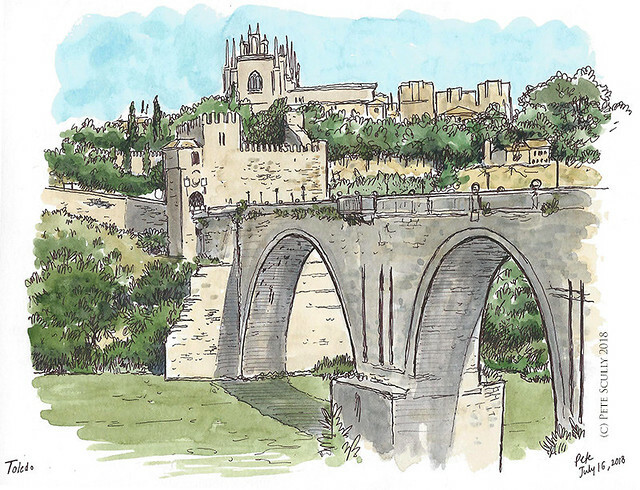 I sketched it from a bus stop on the other side of the river while waiting for the tour bus to pick us up again after I had literally flown across the Tagus…more on that later. Not too far from here is a church where the great El Greco painting ‘The Burial of the Count of Orgaz‘ is displayed. El Greco, the great painter of the Spanish Renaissance, lived in Toledo. El Greco wasn’t of course his real name, he was just called that because he was Greek. A bit like Nick The Greek from Lock Stock, I suppose. Anyway it was very impressive. Also associated with Toledo are two things – steel, and Don Quixote. You see him everywhere. You also see shops selling knives and swords everywhere, often with a figure of don Quixote outside, or maybe a knight in armour. I mean, a LOT of knife shops. They must love cutting things there. 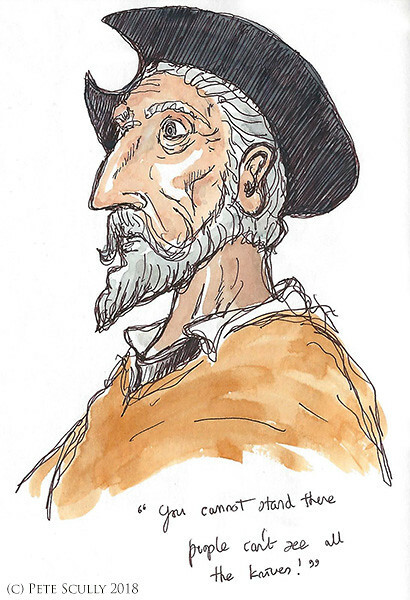 We were waiting for a tour of the cathedral, and while I was waiting I decided to do a quick sketch of the Don Quixote at the knife store next to us. He looked like a surprised Count Dooku, like when Dooku had his hands cut off by Anakin Skywalker and Chancellor Palpatine said “Kill him, Anakin. Kill him now.” After about 30 seconds of sketching a woman who worked in the store came out and looked at me quickly before going back inside. She came back out a minute later and said I couldn’t sketch there because people wouldn’t be able to see the knives in the window. There was a massive window next to me full of knives. She said I could come in and draw the other Dooku – I mean, Don Quixote – inside the shop, but I was like, I will be sketching for maybe another 30 seconds and can also just step back one step if standing here is bothering you. Bear in mind there were lots of other people standing there waiting for the tour to start as well, none of them were holding a sketchbook so none of them got asked to move. And before you knew it, I was done. 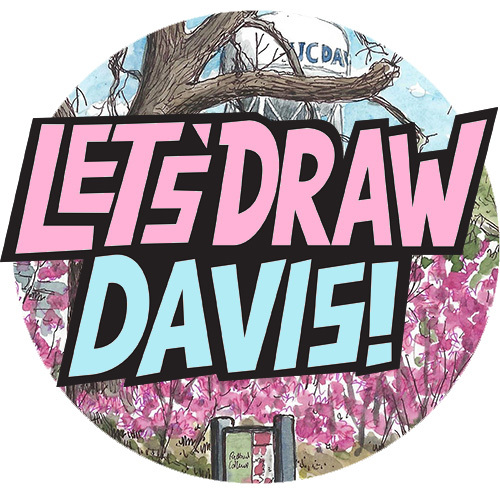 It’s almost like I have written a book about drawing people quickly or something. Next, we took a tour of Toledo Cathedral. That place was amazing! So many ornate details inside. Our tour guide was giving us a lot of the history, but he was speaking in English and Spanish simultaneously, switching language several times in the same sentence, which was starting to get a little distracting. My son was getting a bit antsy as well, so we left my wife on the tour and went off to do a bit of sketching. Just in pencil, I wanted to sketch fast and I had intended on adding paint, but never got around to it. My son drew the same scene below. 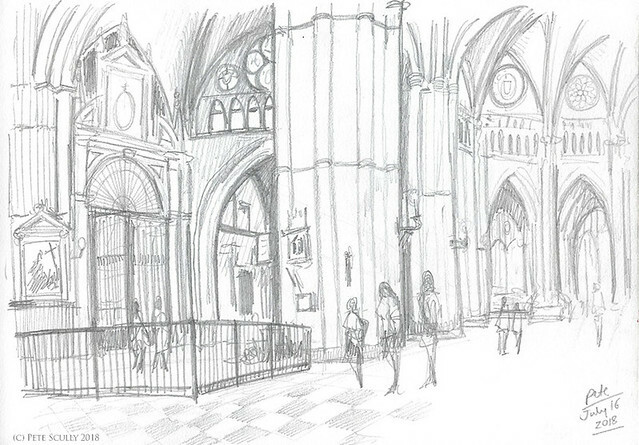 Not every day we get to sketch a massive historic cathedral together! There was no way I was going to tackle sketching all the ornate sculpture of this place. Look at the shot below, with the light coming in from the ceiling. This place was amazing. I did draw outside though. 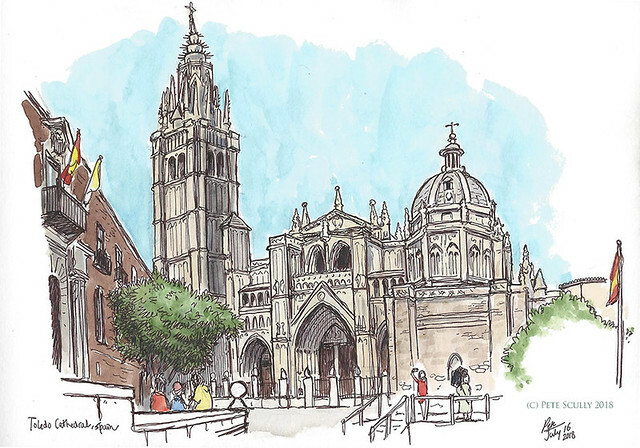 We had a little bit of time before we needed to get back to the train so we took that time to grab a Pepsi Max and sit in the shade, resting our legs, while I drew the cathedral. I couldn’t get too far though, so drew the outline and about half of the details, the important ones – I added the rest along with the colour later. 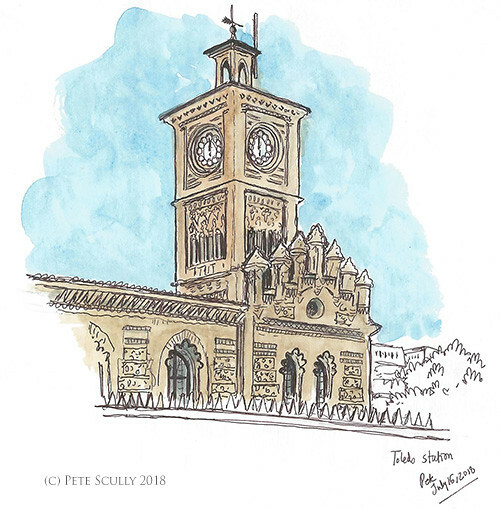 This is the Toledo train station, which I sketched while waiting for our Madrid-bound train. We didn’t have time to go to Segovia on our Madrid trip, but that is the other day excursion I would have liked to do. Not only because it is another beautiful historic and of course Roman town, but also because it sounds like that place in Avengers that Ultron lifted into the sky and threw back to the ground. Next time perhaps!